20 Tips for Bully-Free Schools – Tip #9 Plan Inclusive Parties & Social Activities Keep the spirit of celebration, but be careful of hurt feelings from exclusion. Lots of smaller, relaxed get-togethers make it easier to include everyone. ************* Join Us Daily on BullyingEpidemic.com and Facebook.com/BullyingEpidemic For Tips To Make This a Bully-Free Year! 20 Tips for Bully-Free Schools – Tip #8 Help Kids Fit In & Make Friends Teach kids how to build & nurture friendships. 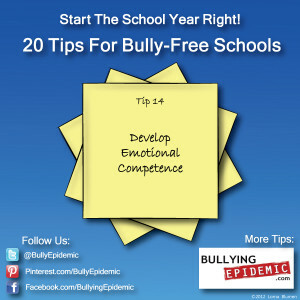 ************* Join Us Daily on BullyingEpidemic.com and Facebook.com/BullyingEpidemic For Tips To Make This a Bully-Free Year!